One of the most enchanting seasonal traditions is Niagara’s annual Winter Festival of Lights. Niagara Falls is completely transformed into a spectacle of brilliantly coloured lights and animated displays that captivates its audience along an 8km route. Illumination Displays & Exhibits – 3D Canadian wildlife displays, the signature visitor’s favourite Noah’s Ark, as well as the Prismatica illuminated art exhibit, plus many more. 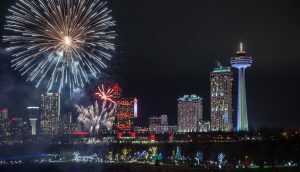 Events – The Fallsview Sound & Light Show, Deck the Falls Walking Tours, a New Year’s Eve Outdoor Concert in Queen Victoria Park, and weekly fireworks shows. If you’re looking to experience all of the magic and wonder of the season, the Deck the Falls Holiday Walking Tours will take you on a festive winter journey. These self-guided walking tours allow for visitors to explore beautifully decorated hotels and venues in the Niagara Falls tourist district, as well as the chance to enjoy gourmet food sampling, beverages, live entertainment and more! This can all be enjoyed at a leisurely pace or by hopping on and off the WEGO buses. Ticket holders will receive their Deck the Falls Tour Pass, which includes vouchers that can be used on any of the four remaining evenings. In celebration of one of Canada’s most treasured products, the 2019 Niagara Icewine Festival offers a special experience in the wintry wonderland of the Niagara region. This annual festival takes place over three weekends: January 11th – 13th, 18th – 20th, and 25th – 27th. Visitors can expect to find this unique wine, which is made from frozen grapes taken off the vine, to be paired with a variety of food combinations at over 40 wineries. Indulge your tastebuds this winter season by partaking in a truly one-of-a-kind Canadian winter experience. For more information on where to enjoy Icewine this winter in Niagara, click here. This year-round attraction has become an iconic Niagara Falls must-do. Journey Behind the Falls offers visitors the opportunity to stand beside and behind the Falls, even in the winter. By descending 150ft. by elevator, you can experience this icy natural wonder from a vantage point like no other. Sub-zero temperatures create thousands of glistening icicles that are undoubtedly photo worthy. However, the world famous Falls are breathtaking from a distance too as the mist freezes on surrounding trees and parklands, creating the ultimate winter wonderland. Please note that the Lower Observation Deck may be closed due to ice conditions, in which case rates will be reduced. 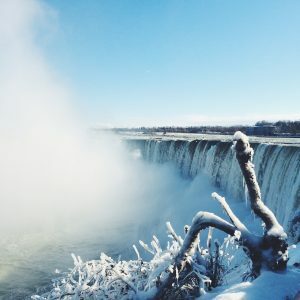 Start planning which activities you’d like to experience for yourself this winter in Niagara!